When you do science, you first establish an hypothesis. You then test it by observing reality and the observations either support or falsify your hypothesis. If the observations contradict your hypothesis you change it to better reflect what you have learned from the observations. After many years of doing science in this way you get closer and closer to a comprehensive model of reality which consists of a conceptual framework, a narrative, a matematical model and the observations. In practice, this ensemble of elements constitute the scientific theory. Darwinism is a scientific theory, a comprehensive model of reality with a conceptual framework, a narrative, several mathematical models and uncountable observations. But many people probably think that Darwinism only consists of the hypothesis. Maybe that's why they say that Darwinism is "only a theory". A scientific theory has a property that an hypothesis does not, however. It makes predictions and when the predictions turn out to be correct you haven't just gotten a stronger theory, you have also proven the theory to be useful. And Darwinism is very useful indeed. You can use it to predict that one of the human chromosomes must be spliced, go look for it and find the splice in chromosome 2. Or you can use it to predict that a transitional fossil should be found in a specific geological layer, go look for it and find it exactly where you thought it would be. But most importantly, you can use it to predict that germs will adapt to their environment and that the HIV virus will continuously change depending on the immune system of their hosts. And you can use those predictions to establish counter measures and save millions of lives. And as we learn more and more about the micro cosmos in the cell and the nature of DNA, we can use the new observations to refine the theory of evolution so that we can save even more lives. When you do science, you don't know everything, i.e. you don't have all the facts. There are things that you know, things that you know that you don't know and things that you don't know that you don't know. 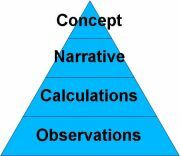 In practice, this means that your model of reality consists of a conceptual framework, a narrative and a mathematical model of what you have observed so far. This is why we never say that a scientific theory is true -- we say that it is useful, like useful for creating the right medicine for the right circumstances. If our predictions are wrong we need to change the theory in order to get closer to the truth so that we can save more lives the next time around. This is why the medical industry spends billions of dollars on refining their scientific theories so that they can save more lives. This is also why the insurance industry spends billions of dollars on refining their models of reality so that the premiums really cover the claims (plus a little margin). The top-down approach is very useful for a layman when getting to the hard science of the model, i.e. the mathematical part of the model and the observations which it all rests upon. Expert judgement is used as a complement to the mathematical model, say, when a sample is statistically insufficient. Assumptions are used as a complement to the observations, say, when there are gaps in the data. As such, you shouldn't encounter expert judgement as a substitute for observations, nor assumptions as a subtitute for mathematics. 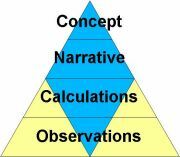 Neither expert judgement nor assupmtions should be based on the narrative or the conceptual framework. Remember, the scientists get there bottom-up, not top-down. If you do find the narrative or the conceptual framework as part of the expert judgement or the assumptions, you have probably encountered a theory which has ceased to be scientific or which wasn't scientific to begin with. All the elements of the theory -- the conceptual framework, the narrative, the mathematical model and the observations -- must be internally consistent. The mathematical models must be plausible. Remember, ”Darwinism is not a theory of random chance. It is a theory of random mutation plus non-random cumulative natural selection." Non-experts should be able to understand how assumptions have been selected among possible alternatives considering the advantages and disadvantages of the different alternatives. Expert judgment should be translated into explanations that can be widely understood. Furthermore, the explanations should describe why the judgement is reasonable and unbiased in view of the observations. These standards bring us closer to the truth.